When I was cruising the Super Duper Inc. website last month, I was looking for items that fit the needs of many of my clients and products the target multiple goals. The two items I’m reviewing today, do just that! 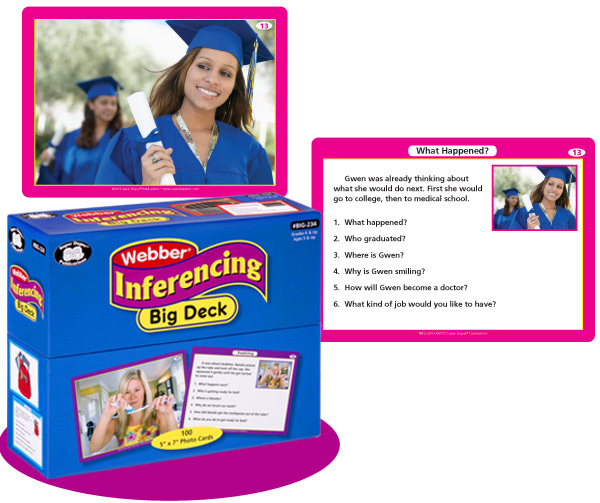 Let’s start with the Webber Inference Big Deck Each of the cards includes a 3-5 sentences story and 6 accompanying questions. The cards target associations, setting, part-whole, what happened? and predicting. I start each activity by having the student just make observations about the image before reading the story and asking questions. 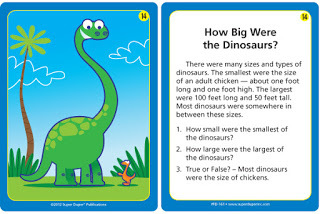 The cards include 100 different images. I love that there are photos, because I can use the cards for other goals as well. I’m always looking for activities that target multiple goals. Specifically I used the settings cards in this packet to work on social pragmatic skills. I pulled out a card and asked my upper elementary social group to brian storm and act out some situations that might happen. 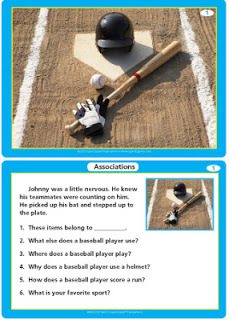 For example, one girl used the baseball card above to initiate a situation where she ‘struck out’ and how her team makes could make her feel better. This item is available for $24.95. 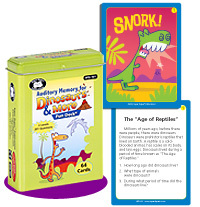 The other item I reviewed is the Auditory Memory for Dinosaurs & More cards. So very many of my second – fifth graders need work on listening and reading comprehension. These cards are perfect for that because they allow me to work on the skills using an interesting topic and in short passages. The cards included are divided into two different classification (general info and specific dinosaur info). I love using these auditory memory cards for articulation (reading) and fluency as well! 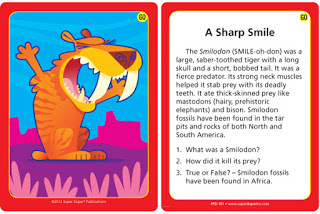 The cards are currently available for $12.95. Do you have any favorite new therapy materials? What’s on your wishlist? « Sticky Hands for Speech & Language!